[ADVERT]There are very few times when one walks into a dessert shop and feels the warmth and guilt-free pleasure of enjoying some top-quality chocolate. This shop has officially become my new haven. 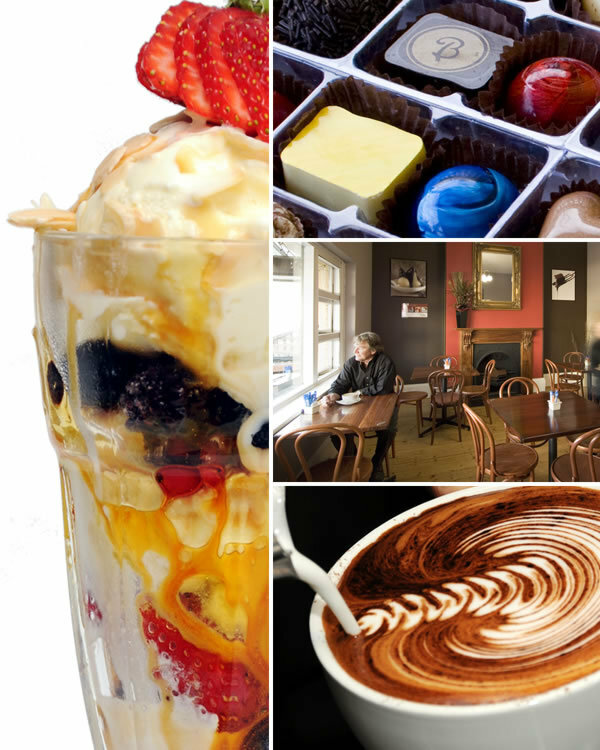 Conveniently located in the heart of Glenelg on Jetty Road, Bracegirdle's is a quaint little shop that harbours some of the most delicious and divine fine chocolate, attractive desserts and freshly brewed coffee with the added ingredient of love. The cafe is small but very cozy, and the perfect place to catch up with friends, co-workers and family. There is a calm atmosphere and the staff are ever so friendly, which adds to the delightful experience of dining there. You know how people say "I'm so full from this meal, but there's always room for dessert?" Well, that may be true in some cases, but after trying some of their delicacies, I would highly recommend you to go to Bracegirdle's with an empty stomach. It's not necessarily the size of the portions that are served to you with a beautiful presentation, but the content itself, that is guaranteed to leave you with a massive dessert baby (for all the right reasons). When I decided to see my friend after two weeks of a hectic schedule, we instantly thought of the perfect way to catch up on life - over a delicious serving of a chocolate fondue for two. For $22.50, this beautiful dessert consists of a small dish filled with the freshest milk Belgian chocolate (there is the option of going for the dark Belgian chocolate as well) over a tiny candle that is lit to keep the chocolate warm and smooth. Be sure to put the candle out after about ten minutes or you'll risk burning it towards the end. It is served with a side of a variety of fruits; strawberries, pineapples, oranges and bananas, carefully cut into little pieces for your liking. It is absolutely scrumptious and is bound to keep your tummy happy for at least three hours. 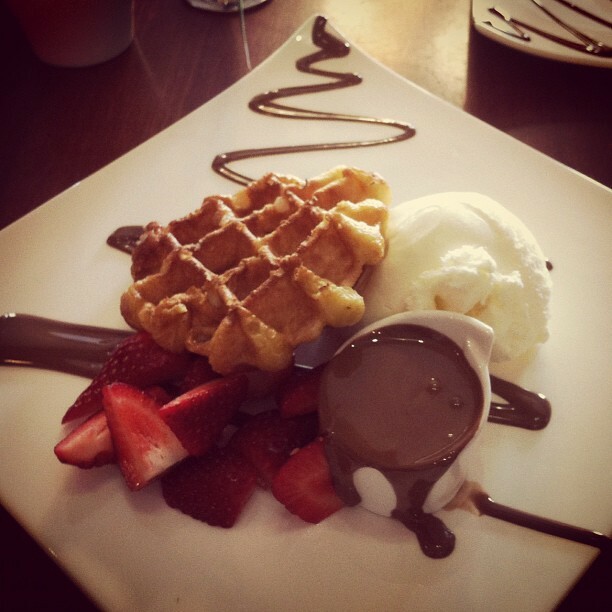 If you are looking for something just for yourself that is a substantial yet compact serve, then I'd recommend the classic Belgian waffle served with fruit, ice cream and chocolate sauce to drizzle on the side. For a mere $12, you can get a delicious, healthy and fulfilling breakfast meal with all the necessary ingredients to make this dessert meal a winner. If you opt for smaller serves, why not add a refreshing drink on the side? The Arctic Mint is a cool peppermint-tasting milkshake that is served with a scoop of vanilla ice-cream and, as the name describes, an arc-shaped chocolate net on top. It is bound to get your palette tingling with joy, so I'd definitely ask you to try this drink if you're into minty flavours. So go on and fulfill your deepest desires of trying chocolate at its finest. 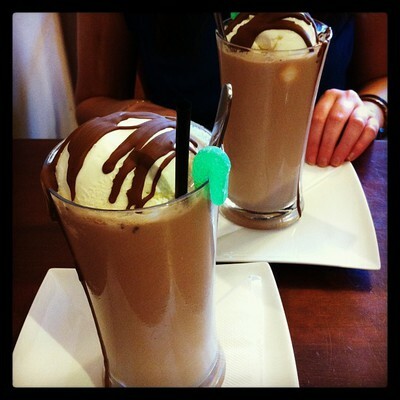 Bracegirdle's products scream of chocolate-drizzled quality and quality. But make sure you have someone to go with - for the experience, yes, but also to let you know whether you end up with a chocolate-covered face and need a serviette (or five). Why? Because who doesn't love chocolate? 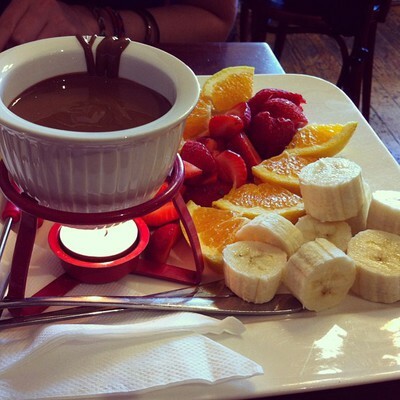 Oh dear, you have me drooling at the sight of that chocolate fondue Xarah! Richly described - chocolate is one of my secret vices and I think I must sample one of those Arctic Mints.